Probably the best day I’ve had on the road. I packed up my gear and was back on San Timoteo Canyon Road at 6:40 am. 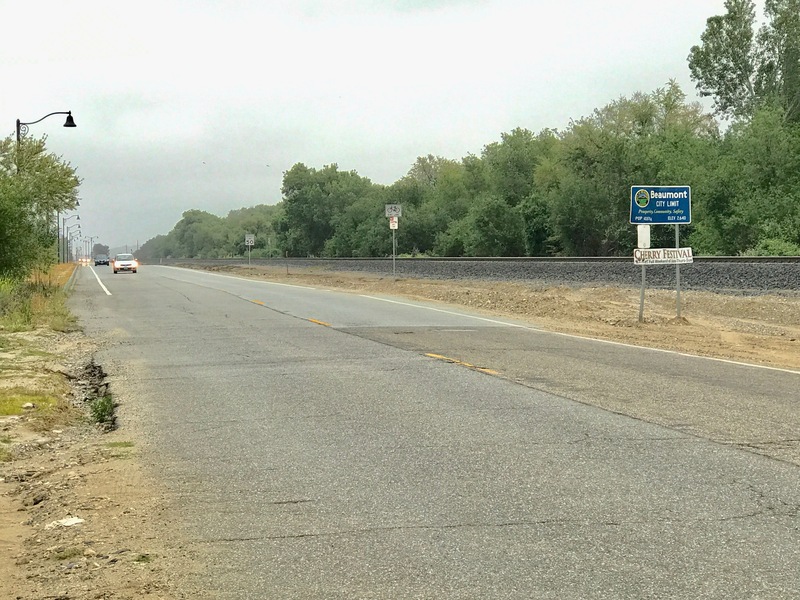 At first, it was more two-lane blacktop, but when I crossed into Beaumont, CA, the road changed dramatically, with a WIDE sidewalk to walk on, and no need to pay attention to oncoming traffic. My iPhone is currently attached to the handlebar of the kart with the Google Maps app on all the time, and I was pleased to get a call from Ben Tarpley, a friend of Jeff, aka Walkingman. Ben is knowledgeable about long walks and had the name of a guy he thought could help with some of my route issues. In the meantime, I was enjoying the sights and sounds–freight trains, a jackrabbit with a very white tail, a large field filled with so many different bird songs that it sounded like an orchestra. The shoes from the North Face are working great, and my blister-related problems are disappearing. I just needed more room for my toes. I walked 13 miles today, from Redlands to Banning. I had planned on stopping after 9 miles (in Beaumont) to give my legs and feet a rest, but the weather was very cool—in the mid-50s to mid-60s—until about 12:30 pm, and the sun stayed behind clouds. I was having no knee or foot pain, so I called and made a reservation at the Holiday Inn Express. Finally, I must credit the cycling lobby, which is responsible for designate bike lanes in so many cities and states. This has been a veritable life-saver in many cases.